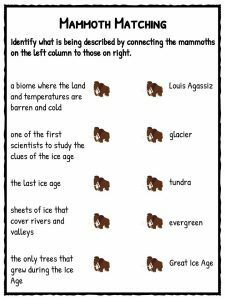 An ice age is a period of long-term reduction in the temperature of Earth’s surface and atmosphere, resulting in the presence or expansion of continental and polar ice sheets and alpine glaciers. 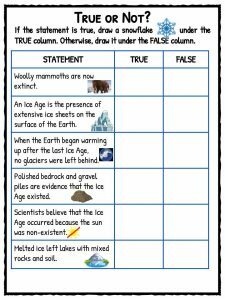 See the fact file below for more information and facts about ice ages or download the comprehensive worksheet pack which can be utilised within the classroom or home environment. There have been approximately 11 different ice ages that have occurred during the earth’s 4.6 billion years of existence. The last ice age was called “The Great Ice Age”, and it occurred 11,000 years ago. During the “Great Ice Age” over a third of the earth was covered in ice, and the air had less carbon dioxide in it. Scientists believe there are two explanations of why the ice ages might have occurred. They believe temperatures were much colder so it never rained, only snowed, or the earth changed its tilt away from the sun. When the earth began warming up after the last Ice Age, glaciers were left behind. Glaciers are sheets of ice that cover rivers and valleys. The ice would begin to melt and then refreeze. This process went on for millions of years. 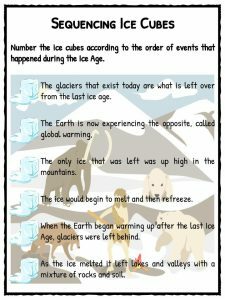 About 10,000 years ago, the earth began to warm up and the ice started to melt. As the ice melted it left lakes and valleys with a mixture of rocks and soil. The only ice that was left was up high in the mountains. The glaciers that exist today are what is left over from the last ice age. In the mid 1800’s, when Aggasiz told scientists that the boulders they saw had been left by glaciers they thought that he was crazy. At this time in history, scientists believed the boulders had been placed there by Noah’s flood or by witchcraft. The reason Louis Aggasiz proved that the glaciers had brought the giant boulders is, because they were made of a kind of rock that couldn’t be found in that area. The boulders were made of granite. Other things proved that the ice age really existed, such as the polished bedrock that was found, large sand and gravel piles, big valleys, and rough mountain tops. 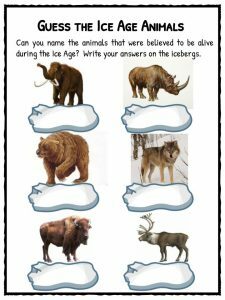 Some of animals that could be found during the Ice Age were the woolly mammoth, wooly rhinos, cave bears, horses, wolves, bison and reindeer. 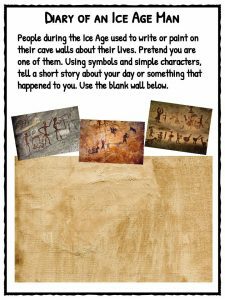 Woolly mammoth, cave bear, and woolly rhino are now extinct, but we know they existed during the Ice Age because people painted pictures of these animals on the sides of their caves. The skeletons of the animals have also been found. Cuts in these bones, from the hunters’ knives, were found and in some cases, the knives had been left sitting next to the skeleton. Ice Age people lived 35,000 years ago. 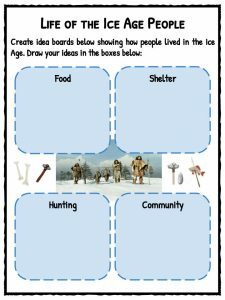 The men hunted and the women and children prepared the food and made the clothing and shelters. Every part of the animal that was hunted was used. The meat and organs were used for food. 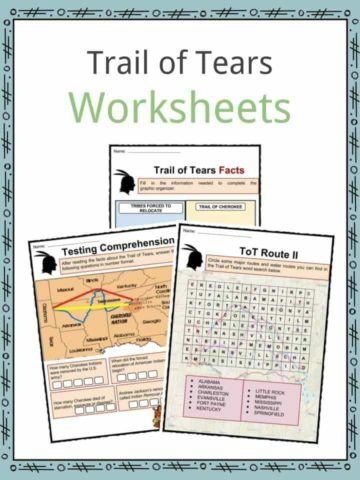 Their skins were cut and sewn into clothing, blankets and shelters. The stomach was used to carry water. 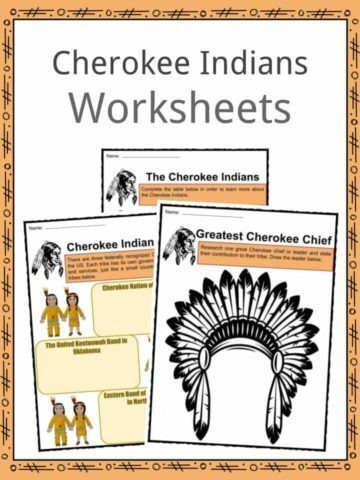 The bones were used for needles, weapons and tools. During an Ice Age the land looks very different. The Earth was frozen and bare. When the land and temperatures are this barren and cold, the biome is called the tundra. Because the weather is so cold and the ground is frozen, very few plants can exit. 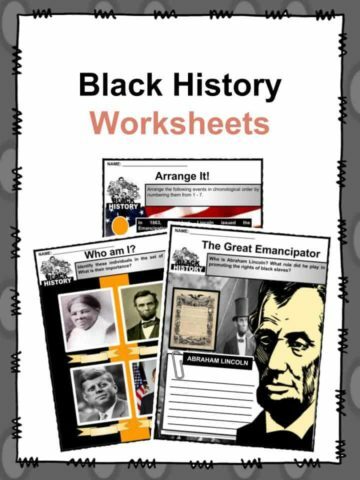 The only trees that grew were evergreens. No grass or flowers grew, just shrubs, bushes, and moss grass. In the northern parts of North America, Europe, and Asia there is still tundra. Right now, the earth is experiencing the opposite. This is an immediate speed up in Global warming. 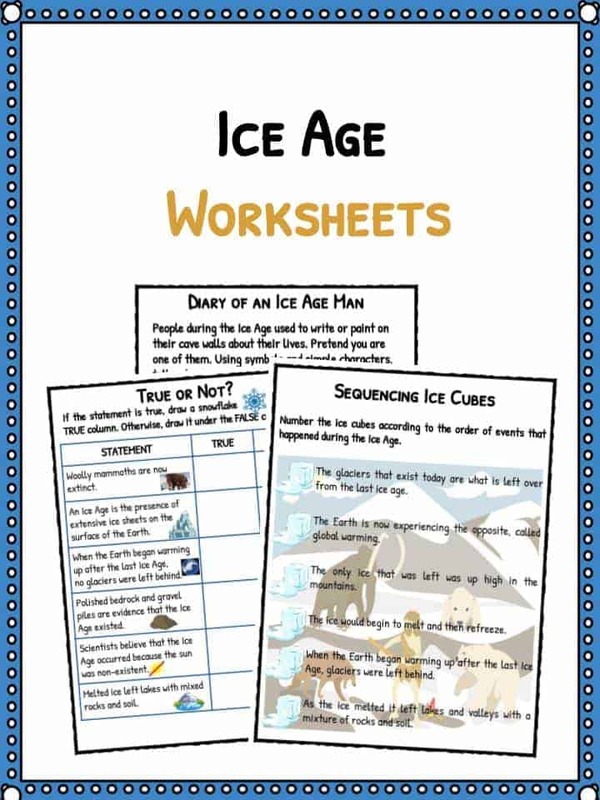 This bundle contains 11 ready-to-use Ice Age Worksheets that are perfect for students who want to learn more about An ice age which is a period of long-term reduction in the temperature of Earth’s surface and atmosphere, resulting in the presence or expansion of continental and polar ice sheets and alpine glaciers.